Goldman: "Expect A Market Correction In The Coming Months"
While there are reasons to be bullish on global equities in 2018 and bear market risks are low, a correction is becoming increasingly likely, Goldman's equity strategist Peter Oppenheimer writes in an overnight note, repeating our observation from Friday that this has been the strongest start for global equity markets in any year since the infamous 1987. As Goldman notes, this "melt-up" has occurred despite the already strong returns last year. The S&P 500 had its second-highest risk-adjusted returns in more than 50 years and MSCI World ($) had its second-highest risk-adjusted returns since the index began in 1970. More concerning, at least for the risk-party folks, is that te year-to-date sharp rise in equity returns has also continued even as bond markets are experiencing sharp risk-adjusted losses. In this context, and expecting the inevitable, Goldman writes that "drawdowns within bull markets of 10% or more are not uncommon" and points out that "there are many historical examples of corrections -- drawdowns of 10-20% - - that are short-lived and do not turn into drawn-out bear markets associated with economic weakness." Of course, there are many drawdowns of 10% or more which turn into full blown recessions, if not a depression. 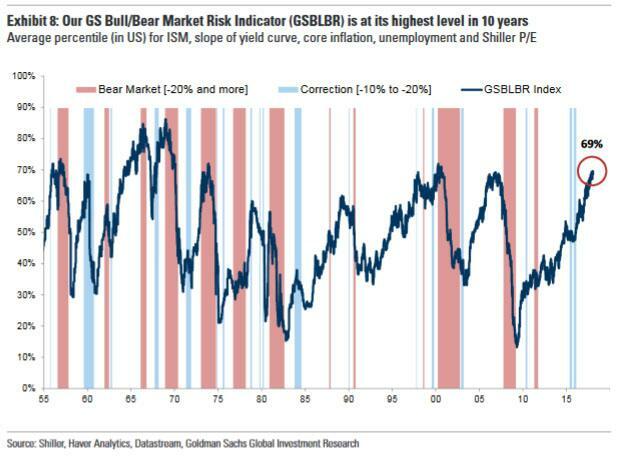 GS defines a bear market as a drop of 20% or more. So if Goldman is right what happens next? 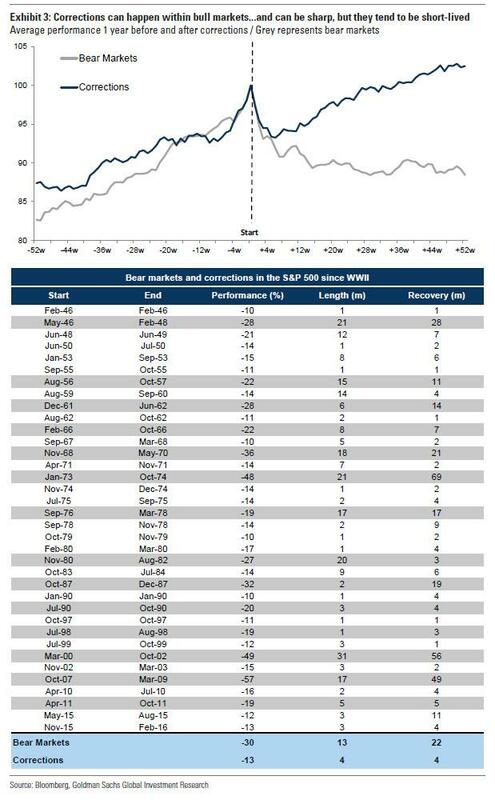 The Goldman strategist calculates that the average bear market experiences falls of 30% over 13 months and takes 22 months to recover to previous levels (in nominal terms). The average bull market ‘correction’ is 13% over 4 months and takes just 4 months to recover. Furthermore, Goldman also brings up the troubling observation made over the past week by every bank from Citi to BofA, namely that 2018 has begun with the S&P 500 and VIX both rising, which however now appears to be driven by a frenzied buying of S&P calls to capture every last bit of levered upside. The increase in volatility amid a market rally may, in part, reflect increasing risks, and may also reflect a bullish willingness to spend premium to add to upside exposure. Whatever happens, however, Goldman remains optimistic and tells its clients that it "would buy the equity market on a correction and, while we recommend being fully invested, would look to hedge downside risks." In conclusion, while Goldman lays out a variety of potential catalysts for a market crash, it notes that "whatever the trigger, a correction of some kind seems a high probability in the coming months." We do not believe that this would be prolonged or morph into a bear market, and so would see it as a buying opportunity. That said, technical factors and positioning could make it rather painful. Finally, not one to shy away from a trade and never letting a crisis trade away from its flow desk, Goldman is urging clients to buy puts ahead of the upcoming drop in the S&P: "We would buy the equity market on a correction and, while we recommend being fully invested, would look to hedge downside risks. Our options strategists have suggested doing this through various structures, including SPX put spreads, which we think could be a good hedge across many markets."